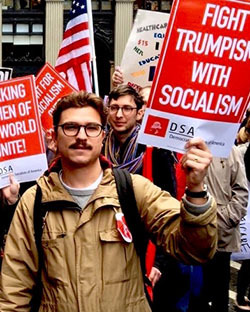 DSA Momentum is a group of committed and experienced DSA member-leaders who together have more than 30 years of experience in socialist and political organizing. We have worked on a number of national DSA committees, including the editorial board of Democratic Left, the We Need Bernie campaign, DSA’s Political Education committee, the Program and Local Development Committee, DSA’s social media team, and the DSA Convention Resolutions and Planning Committees. Our candidates are also leaders in DSA locals in Boston, Chicago, Detroit, East Bay (CA), New Jersey, New York City, and Philadelphia. My name is Jared Abbott, and I’m running for the National Political Committee (NPC) on the DSA Momentum slate. I’ve been a DSA activist, officer and/or chair of several different locals over the past seven years (New York City, Philly, and Boston). I have had the privilege of serving on the NPC for the last four years, the last two of which I’ve served as chair of the NPC’s Steering Committee. On the NPC, I’ve been involved in a wide range of projects from coordinating work between the NPC and DSA staff, organizing and conducting monthly DSA stakeholder calls; organizing and project managing DSA’s new Rose Radio podcast, organizing various parts of DSA’s conventions and conferences; and helping to craft national DSA’s strategic or tactical orientation. I’ve been involved a range of national committees and working groups, including the Program and Local Development Committee. This is by far my favorite DSA work, because it’s given me the chance to get to know and work with nearly 20 new DSA locals in the last year. When not doing DSA work, I am a PhD candidate in political science focusing on Latin American social movements and political parties, and an organizer for the Harvard University Graduate Students Union (HGSU-UAW). I have been active in political and social movement work for nearly 20 years, ranging from graduate student organizing and anti-war organizing to international solidarity work with South American trade unionists and immigrant-rights organizing I was also heavily involved in the Bernie Sanders campaign as a campaign canvasser/phonebanker and also as a public speaker on behalf of DSA. DSA has made incredible strides over the past year. DSA’s growth has allowed us to undertake a bewildering range of work that includes defending the most vulnerable communities in our country from right-wing attacks, as well as building on the momentum of the Bernie Sanders campaign to elect more democratic socialists to office and fight for transformative reforms like Medicare-for-All and the Fight for $15. Despite all we’ve achieved, DSA faces important challenges. There is no guarantee that the gains we’ve made will be consolidated and sustained, much less expanded upon, in the coming years. Many of our chapters, particularly newer chapters in areas that have tended to be less hospitable to socialism than others, aren’t receiving the support they need from national DSA to effectively integrate new members; carry out organizing campaigns; do political education; and build the kind of organizing infrastructure necessary to turn DSA into a truly mass socialist political organization. DSA has done an impressive job of increasing our generational diversity, but with several notable exceptions DSA locals (and the membership as a whole) continue to be largely white, significantly male, and relatively well-educated. While we shouldn’t expect DSA’s demographic makeup to change overnight (something any organization would struggle to do), we should be very clear that DSA won’t become a truly mass organization of the working class unless we make significant progress on this front. Finally, we still have a long way to go in thinking about the direction of our strategy in the South and in rural areas. We need an organization-wide discussion about how to create a relatively coherent national DSA strategy in a country the size of a continent, and whose political contexts vary dramatically from region to region. In this time of massive transition, my unique experiences in DSA give me the capacity to make a meaningful contribution to addressing these issues, as well as the ability to build bridges between different political currents in DSA. I would also bring significant and much-needed institutional memory to the NPC while also being honest about mistakes we’ve made. I am eager to learn from those mistakes and work with members throughout the country to turn DSA into the organization it can and should be. My name is Christian Bowe and I’m a member of the Central New Jersey (CNJ) local. Prior to running for the NPC, I was the chair of the CNJ chapter and helped bring it to existence last summer. After working on the Bernie Sanders campaign in Pennsylvania, New York and New Jersey, I followed his call to continue the political revolution and started to build DSA both nationally and in my home state. Before DSA adopted a 50 state strategy, I began to recruit new members specifically in the Rust Belt and Appalachia to build upon the success the Sanders campaign had in these areas. Nothing has brought me greater pride over the last year than seeing new chapters form in places like Kentucky and West Virginia getting organized. Our growth in the South and Rust Belt is the most exciting part of our organization’s work and it’s at the center of all my national organizing. In New Jersey, DSA went from a dozen committed people statewide to a place where we now have 500 members in three chapters, two organizing committees and two YDS chapters covering every part of the state. As chair of our CNJ chapter, I worked alongside fellow members in a number of different campaigns: the Fight for $15 campaign to organize mall workers; a sanctuary county campaign with local Latino action networks; a Medicare-for-All campaign involving block walks in important election districts; support for Communications Workers of America members during the 2016 Verizon strike; and winning paid sick leave ordinances at the city level. At the national level, I serve on the internationalism, religious socialism and labor working groups as well as the social media committee. I’ve also been active in helping to lead DSA’s embrace of a distributed digital model of recruitment. Together with on-the-ground organizing, digital recruitment has helped to drive one of the biggest membership surges in DSA’s history. DSA now reaches over 10 million people per month online - 15 times the number of people we did before. This has played a critical role in helping DSA become a truly nationwide organization with chapters in all 50 states. Digital organizing has also helped to rebuild DSA’s commitment to socialist internationalism.Through it, we’ve built ties with Momentum (UK), Scottish Labour Young Socialists (SYLS), Die Linke (Germany), France Insoumise, Podemos (Spain), and others. If elected to the NPC, I pledge to work alongside my comrades to grow DSA to at least 50,000 members and build it into the largest mass membership, multi-tendency socialist organization in our country’s history! 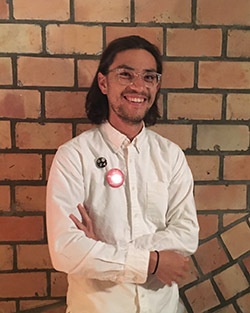 I’m Jeremy Gong, and I am the former co-chair of the DSA East Bay chapter. I joined DSA in November after the Trump election, and have been extremely active since then. In June, I stepped down as co-chair and was elected as an at-large member of our leadership board. In East Bay DSA, I have been a leader building the chapter since it went from a couple dozen active members to a couple hundred. It has been a huge challenge, often overwhelming, but always very rewarding. The camaraderie here has been incredible, and the growth of each and every member, politically and as organizers, is truly inspiring. In the last six months, we’ve trained hundreds of canvassers to hit the streets and talk to their neighbors about single payer healthcare – and socialism! Through this mass canvassing work, we have trained dozens of skilled organizers, brought in hundreds of new members, and built a culture of committed and politically grounded organizing. I've also helped our chapter to pilot several different political education programs, the latest of which has been a highly successful Socialist Summer School. These have proven to me that accessible Marxist political education is not only possible with new members, but is something that DSA members at all levels of experience want more of. We have also had many productive debates about internal democracy and organizational structure, and revamped our own structures while redoing our bylaws. These experiences have encouraged me to run for the NPC and co-author the Spring Platform. If elected, I will work to help chapters across the country build comparable organizing, political education, and internal democratic activities. If we do that, I believe DSA can become a fighting political force unlike anything seen on the US Left in generations. I’m Dustin Guastella, and I’m a member of Philadelphia DSA. I first joined DSA in 2011 and have been an active member in my local and on national DSA committees ever since. I am currently a Philly DSA Steering Committee member and a coordinator on DSA’s National Design Committee. I have recently become interested in investing more of my time into the national organization because of DSA’s rapid growth and the exciting political moment we find ourselves in. I am running for NPC on the DSA Momentum slate because I want to see our organization become a nationwide force for class politics. DSA should be the natural political home for the millions of workers, students and activists who are disillusioned with the current system and want an alternative. I grew up the son of a hairdresser and an electrician in Northeastern Pennsylvania. Many of my childhood friends are trapped in long-term unemployment or dead-end low wage jobs. As a result I became interested in what could be done about this through politics and collective action. Growing up, I was lucky enough to have a teacher who encouraged me to go to college and there I found Philly DSA. The Occupy movement and the rapid growth of Jacobin magazine turned me from a passive observer to an active member of DSA and an advocate for a strong working class politics. After I graduated from Temple University I went to work in the labor movement as the regional coordinator for the Southeastern Pennsylvania Area Labor Federation (AFL-CIO). While there I learned the ins-and-outs of the union movement - its weaknesses and shortcomings as well as its enduring strengths. In the lead-up to the 2016 presidential campaign, I served as co-coordinator of DSA’s national We Need Bernie committee. More recently I have worked on building and consolidating Philly DSA as it works to retain and develop the huge numbers who have joined as part of the “Trump bump.” I’ve worked alongside Natalie Midiri, Jared Abbott (now in Boston) and Joe Schwartz in our local for years, and with Jeremy Gong to build a national Medicare-for-All campaign for DSA. DSA needs a coherent vision, a political program, and a strategy for achieving it. I worked with comrades across the country to develop what we think the best political vision for DSA is in the coming period through our DSA Momentum platform. I am excited to go into DSA’s largest convention to debate our perspectives and build a stronger organization together with comrades from around the country. I hope you will support us! I’ve been am active member of Detroit DSA since I joined as a college student in the early 2000’s. I became a socialist because so many of my friends and loved ones have been struggling to get by working long hours for little pay. Living in southeast Michigan, I grew up around people who made good lives for themselves because of victories of the labor movement, and I saw the devastation caused as those victories have been chipped away. When I’m not doing DSA activities, I work as a substitute teacher. I also work part time helping several young adults with disabilities improve their daily living skills. My socialism is informed by my work in our public schools and my work with people who rely on medicaid and medicare to survive. I’ve identified as a feminist since I was a teenager, and I am also a member of the lgbtq community. I know that our socialism must include strong support for members of marginalized communities. 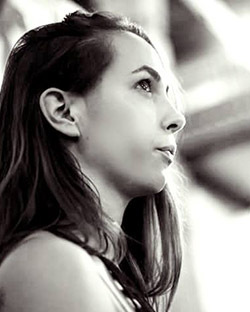 I’m running for the NPC because I greatly care about DSA and our future. I want us to be an organization that is truly nationwide. Here in Michigan, we have been helping to build new chapters around the state, and I believe that we have a model for what can work throughout the country. We are an inter-generational chapter where everyone works well together, and have been very successful at turning new members into active participants in our chapters. I have a lot of experience at both the local and national level, and would like to put my skills to use continuing to help grow DSA. I’ve been on Detroit DSA’s executive board for a number of years, and have been vice-chair of the chapter for the past few years. One of my first big projects with Detroit DSA was to help lead a successful campaign which pressured Wayne State University to adopt a policy stating that the university would not produce products made in sweatshops. For about five years, I handled all of my local’s social media. I also have a lot of experience canvassing, doing coalition work, and working with socialists who have a diverse range of opinions. 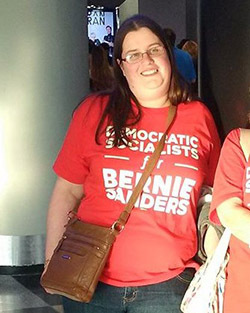 Detroit DSA was instrumental in helping Bernie Sanders win in Michigan’s primary election and, with several other DSA members, I helped run the Bernie campaign office in Pontiac. 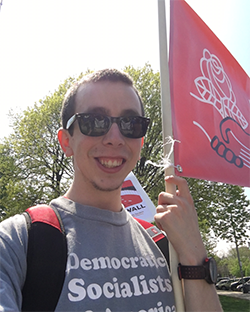 At the national level, I led DSA’s Drop Student Debt campaign for the first few month, helping to get that campaign off the ground. I’m a very active member of our social media team, and have been co-chair of that committee for the past few months. I am also a member of the DSA Queer Working Group and recently created a Facebook group for LGBTQ DSA members. This is really an exciting time for DSA. We are growing and now have resources we couldn’t have imagined a year ago. But, we need to grow wisely. We need to ensure that we have a strong group of activists who can train our new members to be leaders in their newly formed chapters. We must ensure that all of our chapters have a voice in the organization. Our members should have the opportunity to participate in regular strategy discussions about the direction DSA is going. We also need to had a strong message that will resonate with people around the U.S. I think being a part of a strong Medicare for All campaign would give us a great opportunity to share our vision with a much wider audience. I’m proud to be running as a part of the Momentum State (https://www.dsamomentum.org/) with a group of committed, experienced activists who have a strong vision for DSA’s future. My name is Ella Mahony. I grew up in Boston and have been in New York since 2011. I’ve always been interested in politics but it was through student-worker solidarity activism on my campus that brought me to socialism. Through that work I started organizing with UNITE-HERE!, a culinary and hotel workers’ union. I spent my first summer with UNITE-HERE! organizing airport workers in Newark, New Jersey. This entailed long, hard months traversing Newark almost entirely on foot to visit workers at home and convince people to risk what little they had to try to achieve something better. That experience showed me two things that made me into a socialist. The incredible barriers low-wage workers face in trying to win a better life exposed the structural causes of poverty to me. Despite these challenges, collective action through a union showed me that workers can fight back against those structures, and that this is the only path to working-class liberation. From there I was lucky enough to organize with the New York State Nurses Association and with OUR Walmart in Dallas, Texas. Through union organizing and a journalism class at Brooklyn College, I came into contact with Jacobin magazine. I have been working there as an assistant editor since 2015. Jacobinhas been important for me because it gave me a chance to form an intellectual framework to describe the ideas I had cultivated through working and organizing. I think that every socialist should have the chance and the space to do the same - not so that we become academics, but so we can be serious thinkers about the character and direction of our movement. One of the main goals of socialism is to arm the working class with the tools to decide its own future. Intellectual formation is key for decoding the political choices at hand and having a democratic debate about the best way forward. This is the reason why I have been working with the national Political Education Committee during the past couple of months. Finally, I will arrive to the convention from Sao Paulo where I have been researching and organizing with the Brazilian left for the past six months. I’m looking forward to applying this experience to deepen DSA’s internationalist commitments and to bring new organizing ideas from socialist struggles around the world into the US context. 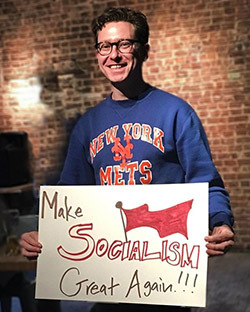 I’m Chris Maisano, and I’m a member of New York City DSA (NYC-DSA). I first joined DSA as a high school student in the late 1990s, and I’ve been a committed socialist ever since. I’ve been in and around DSA for many years, and the rapid growth of our organization is one of the most exciting things to happen in my political lifetime. I’m running for the NPC on the DSA Momentum slate because I want to consolidate our gains and transform DSA into the kind of mass socialist organization our country desperately needs. My commitment to socialism flows from two main sources: my life experiences and a long-standing devotion to political self-education. My family followed a classic working-class immigrant trajectory: from Italy to New Jersey by way of Brooklyn. Watching my parents fight every day to provide for my sisters and I taught me the harsh lesson that hard work isn’t always rewarded, and stimulated my interest in learning why the world is the way it is. That interest was furthered by a somewhat unlikely source: Catholic school. I went to both public and Catholic schools growing up, and it was the Church that first exposed me to critical perspectives on capitalism and militarism. Learning about Catholic social teaching, as well as our government’s support for right-wing death squads that killed priests and nuns in Central America, set me on a path that eventually lead to socialism and internationalism. I have long since left the Church, but I’m grateful for the important role in played in developing my political perspectives and my hunger for justice in the world. I went to college at Rutgers, and during that time I participated in the anti-globalization and anti-war movements. After graduation I went to work as a union organizer, and then obtained a degree in library science. I worked for about five years as a public librarian in Brooklyn, and was a rank-and-file activist in AFSCME District Council 37 (DC 37), Local 1482. From there I went to work as a research staffer for DC 37, and today I work for a nurses’ union in New York. Altogether, I have about a decade’s worth of experience in the labor movement in a variety of different roles and settings. Over the last year, I have worked alongside many dedicated comrades to help build NYC-DSA into the strong and dynamic local of 2,000 members it is today. I just finished a one-year term on our local’s Steering Committee, and am active in our labor organizing and political education activities. 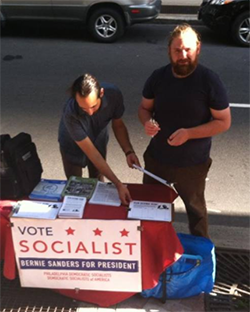 I worked on the Bernie Sanders campaign in New York and Philadelphia; helped to coordinate our strike solidarity efforts during the 2016 Verizon strike; worked with fellow members to organize an extremely successful holiday fundraiser; and served on the planning committee of the recent NYC-DSA Socialist Day School, a day-long political education event. I have also been a contributing editor for Jacobin magazine since its first issue, and strongly believe that socialist activists must be thinkers (and writers!) as well as fighters. An organization like DSA is lost without a coherent political vision that unites all members behind a common project and allows us to speak clearly and confidently to the people at large. This is what distinguishes us politically from liberals and progressives, and prevents us from lapsing into just another activist group. For me, there is no socialist movement without a strong and militant labor movement. If elected to the NPC, I pledge to work closely with all DSA members who share an interest in rebuilding working class power in an extremely hostile climate. I am very proud to be running on the DSA Momentum slate, and I thank everyone who supports us! 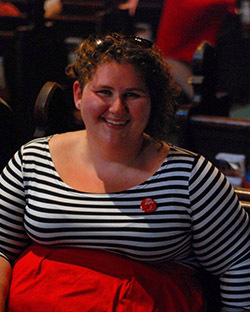 I’m Natalie Midiri - community organizer, educator, and Co-Chair of Philadelphia DSA. From 2013-2016 I was a teacher at the Collingswood Playschool, a democratically run member cooperative daycare program. I’ve worked on SEIU’s Fight for $15 fast food worker campaign and at the Philadelphia Unemployment Project, an unemployed worker’s council for low-income Philadelphians. In DSA, I’ve served on the Amendments and Resolutions Committee for the 2015 and 2017 National Conventions, helped organize Young Democratic Socialists conferences, and worked to launch Philly DSA’s leadership bootcamp.